Maintaining a successful social media presence can be a daunting task — juggling your profiles on multiple platforms while keeping pace with the ever-changing social media world is intimidating. 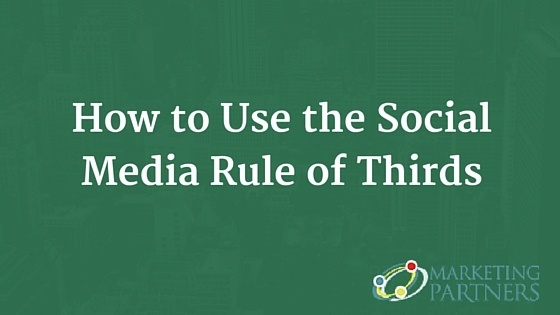 Fortunately, there’s a ‘golden rule’ of social media strategy that involves a simple formula, but one that is often overlooked: The Rule of Thirds. Generally speaking, social media accounts want to abide by the rules of thirds: 1/3 promoting your product or services, 1/3 interacting with others, and 1/3 sharing industry news and tips you believe your followers could benefit from. It sounds simple, because that’s exactly how it should be. Ultimately, social media boils down to communication, and just as the best face-to-face communication is done with two-way understanding in mind, (rocket scientists aside) social media is no different. It’s important that you balance your social media posts just as you would your face-to-face conversations with a friend. Endorse things that others have done, show that you’re involved in relevant news, and limit how much you talk about yourself. First and perhaps foremost in your mind: Promotion. This is often where an organization’s social media attention focuses, as it’s easiest to talk about what you know best — your own goods and services. When giving a speech, it’s not uncommon to include a personal anecdote to amplify the message. The speech loses value, however, when the anecdote becomes the bulk of the message. What was originally meant to supplement the main idea has now become the focus, and this is where many accounts exert most of their social media efforts. Consider the example that we can all unfortunately relate to: meeting someone who only wants to talk about him/herself. When someone limits the topic of conversation to the individual, there isn’t any real conversing. So, social media managers, get off your high-horse and switch up the topics. It’s in the name -- ‘social’ media. It exists to become a platform where people can interact and share experiences with each other. Conversing with your public could be as simple as liking an influencer’s post, retweeting or sharing someone else’s message, or mentioning a follower when you post a question to start a conversation in your community. Ignoring the conversational aspect of social media is similar to a speech-giver skipping the Q&A section of the seminar. Without creating an environment to listen to the audience, you’re sending an “I don’t care for your input” type of message, and that could bring a swift end to any community building. 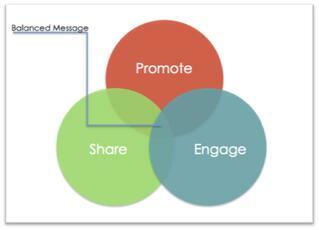 The last element of the social media rule of thirds goes into the bigger picture, and thus brings us to the share phase. Just as conversations show interest in other people, sharing relevant content shows interest in your industry, something greater than your brand. Any nonprofit, business -- you name it, is part of a whole. Using content that revolves around organizations like your own shows a greater comprehension of the industry. Additionally, you avoid the trap of talking too much about your own goods and services, which would otherwise take away from the validity of your social media messaging. Looking at which other non-profits have found the right balance can encourage your messaging (and hopefully results!) to mirror theirs. Not sure where to start? Not to worry, in this section we’ll be looking at a couple of nonprofits who have created social media posts that balance their overall message. 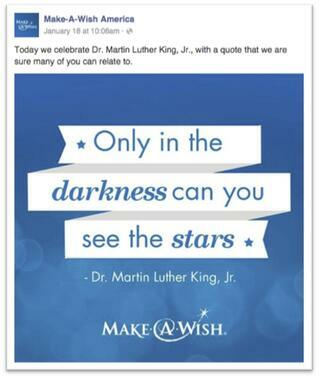 First on our list comes Make-a-Wish. While they could solely post their own content surrounding the heartwarming stories of kids getting their wishes granted, Make-a-Wish ties in external content to represent their interests. What made this particularly effective was the quote they used “Only in the darkness can we see the stars.” which maintains the lens of positivity and hope that the brand is built on. Next comes the American Red Cross, which uses the industry news portion of the rule of thirds to give out information/tips based on trending issues, such as preparation tips for big storms, and safe activities for children. They show their dedication to society’s welfare in more ways than just posting about what ARC members have done, and that boosts the strength of their message. As nonprofits are socially driven enterprises, it’s essential that their social media posts don’t exclusively cover what they’ve done. Only using the ‘promote’ section of the rule of thirds would spell disaster for nonprofits, as it would express self-absorption – the antithesis of advocacy for public good. The bottom-line for creating social media communities that will thrive is all about finding a balance. Aiming for 1/3 promotion, 1/3 conversation, and 1/3 industry information, you can deliver the most successful messaging to your audiences. James Randolph is a senior at Champlain College majoring in Public Relations, with a specialization in marketing. He's learned a smile is a universal language, whether at home in Connecticut, in Vermont, or in Madrid, Spain.